A Missouri man became the 17th person in the U.S. and the second person in the state to die after being struck by lightning this year, according to the National Oceanic and Atmospheric Administration. Over the past decade, an average of 24 people have been killed by lightning strikes in the U.S. between Jan. 1 and Aug. 28 each year, NOAA said. But many of those deaths are preventable, and experts say all that’s needed is more awareness and for some common myths around lightning to be shattered. Ahead, here’s what you need to know. 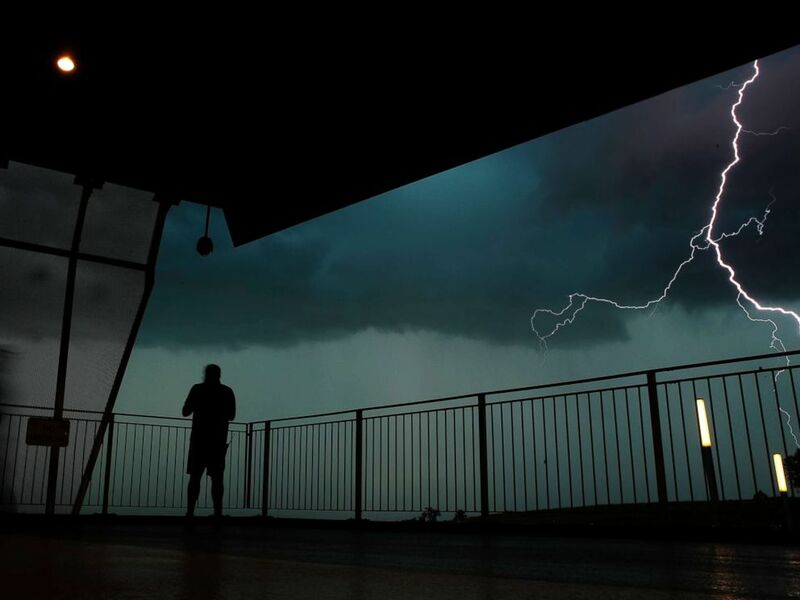 A man watches lightning from a concourse at Kauffman stadium during a severe storm before a baseball game, Aug. 28, 2018, in Kansas City, Mo. MYTH: Very few people survive being struck by lightning. FACT: More people survive than you would think, but some are left with life-long debilitating injuries. Studies have found that in the United States, nine out of every 10 people struck by lightning survive. This is partly because much of the energy of lightning strike has already dissipated by the time it reaches people’s bodies, and partly because much of the current flows over the body instead of into it. Most importantly, people survive being struck by lightning because a bystander initiates CPR. People usually don’t survive a lightning strike without outside help. But surviving is only part of the battle, as some people experience long-term health effects. “Really, that’s only part of the story because many people are left with lifelong debilitating injuries — from headaches and nausea to loss of memory,” he added. 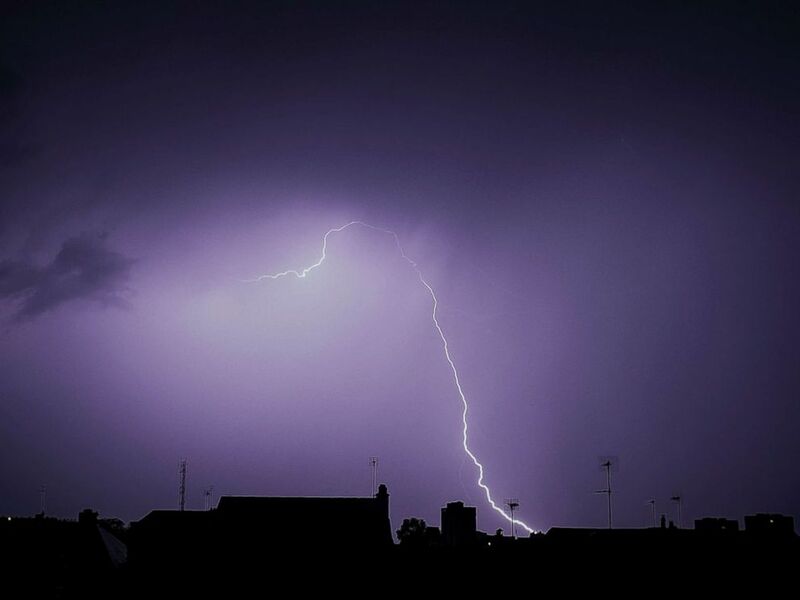 MYTH: You can lessen your chances of being struck by lightning by crouching down or lying flat on the ground. FACT: Crouching or lying flat is unlikely to protect you. This myth is understandable because it draws from a well-known fact: lightning strikes higher objects more often. The Empire State Building, for example, is struck by lightning an average of 23 times a year, according to the National Weather Service. But here’s why going closer to the ground won’t make much of a difference: Only a small portion of all lightning strikes on humans are direct strikes, Mary Ann Cooper, a former professor of the University of Illinois and an international medical authority on lightning injuries, told ABC News. Your best bet, she said, is to head inside the nearest building. 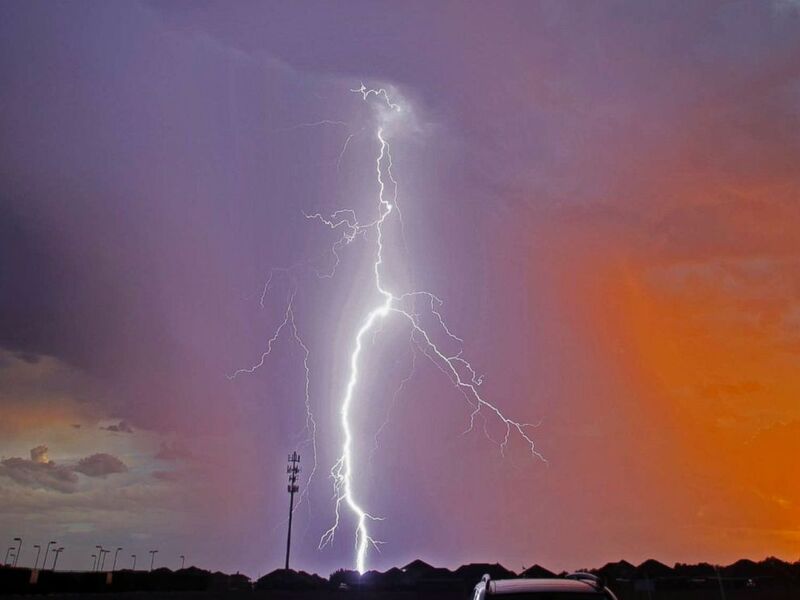 Lightning strikes, Aug. 24, 2018, in Odessa, Texas. MYTH: If you’re wearing rubber-soled shoes, they will draw off the current, and if you’re wearing metal objects, you’ll be hit. There is no way your attire has any effect on the direction up to 2 million volts of electricity takes, Jensenius said. And wearing a metal bracelet doesn’t mean lightning will electrocute you. “Typically, people may have burn marks, but usually those are because lightning simply heats up the metal and that leaves burn marks,” Jensenius explained. MYTH: Once you’re inside the house, you’re totally safe from lightning. FACT: Even inside the house, you need to keep away from things that conduct electricity. Unfortunately, being inside a building isn’t always enough to protect you, said Cooper. That’s because one of the ways lightning strikes people is by transmitting it through something you’re holding. Which is why, during a thunderstorm, it’s a good idea to stay inside the house but away from corded phones, electrical appliances, wires, TV cables, computers, plumbing, metal doors and windows, according to the National Weather Service. Lightning is seen during a storm over the roofs in Tours, France, Aug. 29, 2018. MYTH: If you touch a lightning strike victim, you could be electrocuted. FACT: It’s perfectly safe to touch a lightning strike victim as you administer first aid. This might be the most dangerous of all the myths, said Cooper, because CPR plays a key role in helping save victims. Most people struck by lightning require immediate medical attention because they’re likely to have suffered cardiac arrest, so it’s important for people to know that the human body does not conduct electricity. For more information on lightning strike safety, visit the National Weather’s Service’s website.